Finished up painting the figures-proper; including jazzing up some of the tunics. Awaiting the arrival of the LBMS shield transfers order. Well, sorry for bombarding you all with close, back-to-back posts, but wanted to show them off as not sure when the transfers will arrive. Hopefully soon, and once completed I'll post a "final" one with them based. Cheers to you all! Better and better! Will be awesome unit! Agree. My favourite in Ancient plastics. The shield transfers for them are great. 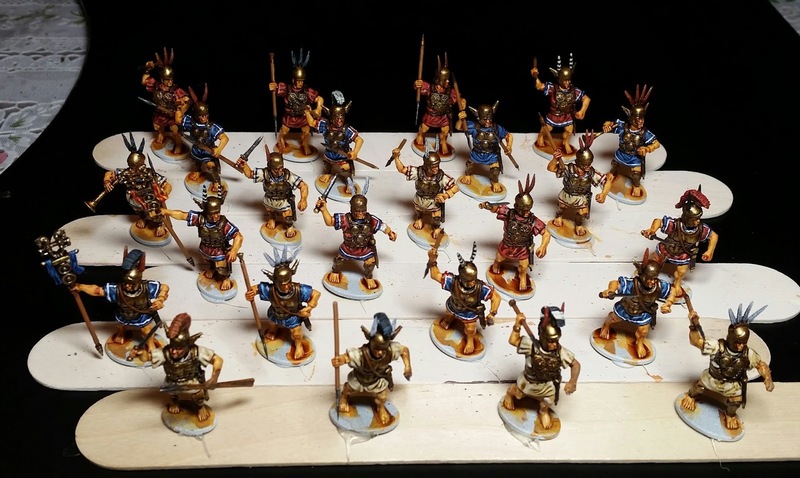 It is easier to do more fancy patterns on the tunics of the unarmoured Samnites. Nice progresses, they look great! Keep up the great results. These little details has made great difference! Lovely work as always and steaming along as always! Lovely work Dean, good luck with the transfers, I hate transfers! They look fantastic! The washes really set off the detail without blocking any of your great brushwork. These are real beauties Dean! Victrix Greek Archers & Happy Thanksgiving Too!